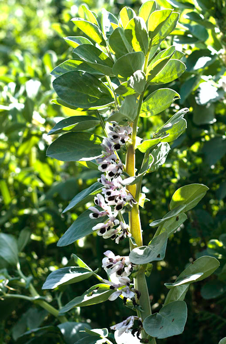 Beans are one of the silent workhorses of the vegetable garden, providing plentiful crops while simultaneously enriching the soil with much-welcomed nitrogen. These food crops are part of the legume family, a group of plants whose roots have special nitrogen-fixing bacteria. Marin gardeners adore this magical feature because nitrogen is one growing necessity often in short supply in our soil. Bush beans usually grow to around two feet tall and wide. They include green, yellow wax, and purple pod varieties. Bush beans have a production period of two to three weeks and produce fewer beans than pole types. 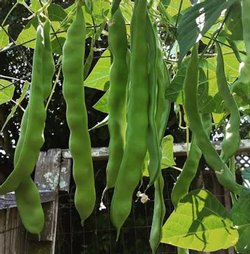 Pole beans are a smart choice for space-challenged gardeners because they take up less of a footprint than bush varieties and usually produce a larger crop. These twining vines rocket five to ten feet skyward so long as they have a sturdy support on which to climb. Growing pole beans does not require any fancy contraptions. Any sturdy support will do: an old ladder, bamboo poles or sticks tied together to form a tepee, old wire or slatted wood fencing, or heavy-duty nylon string strung between two makeshift poles. Many types of homemade trellises work as long as they provide the needed support for the vines. 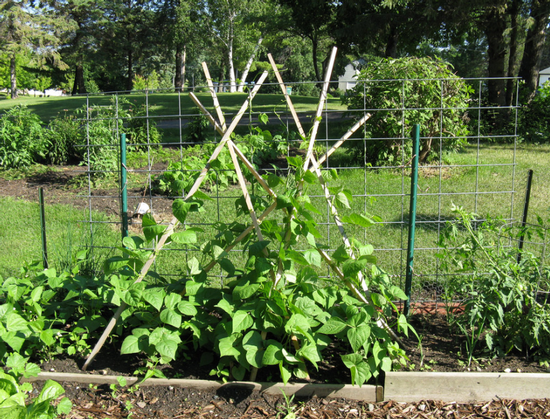 Trellises should be six to eight feet tall and sturdy enough to withstand strong winds and the weight of the beans. Expect pole beans to produce for four to six weeks. Beans are easy and satisfying to grow in summertime heat. They grow in most any soil but prefer it well drained and chock full of organic material. Plant bean seeds directly into the garden and protect the sprouts from snails. If watered regularly, beans are seldom bothered by pests. Generally speaking, you’ll need three to six bush bean plants or 24 pole bean plants to produce enough beans for a family of four. Snap beans are picked when the seeds are tiny and the pods succulent. Shell beans are harvested when the seeds are tender and the seed pod is thick and leathery. Once legumes begin to fruit, it’s important to harvest regularly. Bean plants that get to the dry-bean stage will slow down or even stop producing. It’s best to plant two or more crops of snap beans (also known as string beans) two to three weeks apart for a longer harvest. Keep an eye on the bottom of the plant where the first pods form to be sure no pods went unplucked. And at the end of the season, don't forget to leave a few on the vine to dry so you can replant those seeds next year. 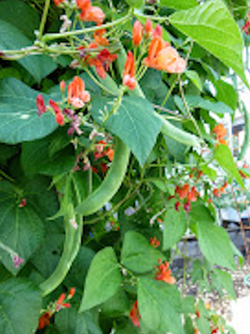 Scarlet runner beans feature showy red flowers and long, tasty beans. Romano beans are fast-growing vines that produce extra-long, delicious, flat pods. 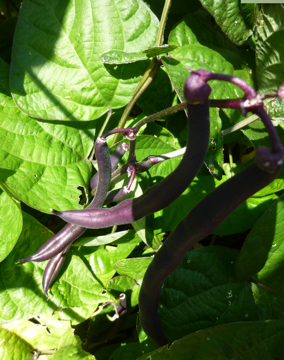 Purple beans add color to the vegetable garden and are fun to grow. They turn green when cooked. 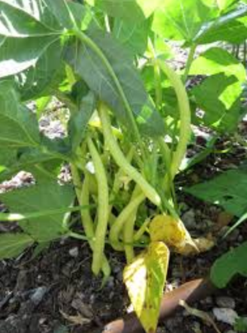 Yellow wax beans are attractive and a fun variety to grow with children. Fava beans add nitrogen to the soil and are healthy to eat, too.